I’ll be at LeWeb London with brands, and the agencies and software vendors who serve them as a keynote and co-host on the social track with Cedric Giorgi , I hope you’ll join us! I’m pleased to attend LeWeb this June in London (new venue, new date, same quality show) it’s one of the highest production conferences in our space at scale. One of the fantastic things of the high-production global show is the focus on the future of how the web is moving the world, business, and ourselves forward. I’m glad that Loic has selected the theme “Faster Than Real Time” based on Altimeter’s research themes (Adaptive Org), which will stem the many speeches at the event, and I’ll be there to speak with brands on stage, and conduct research live from these sessions. What does Faster Than Real Time mean? It means predicting what people want –based on signals, data, and computing. The amount of data being shared by consumers, and objects around the world is staggering. From body data from Nike+ and Nike Fuel Band, to checkins from consumers on Foursquare to the data rendered in Instagram pictures from mobile devices everything is being captured and shared. Even non-digital items and goods will soon have a digital signature as Google roles out Goggles that allow us to overlay data on everything and anything. As a result, this data can be processed by machines, allowing us to anticipate and eventually predict what people will want and do, giving rise to an incredible opportunity for brands, governments, and peers to serve up needs before you actually know you need it. For example, Target’s recent example of predicting a young gal was pregnant before her farther actually knew is a bellwether of this future change. Loic and Geraldine have offered a 100 Gbp discount to readers of the Web Strategy blog, register here and use “JEREMIAH” as the discount code. 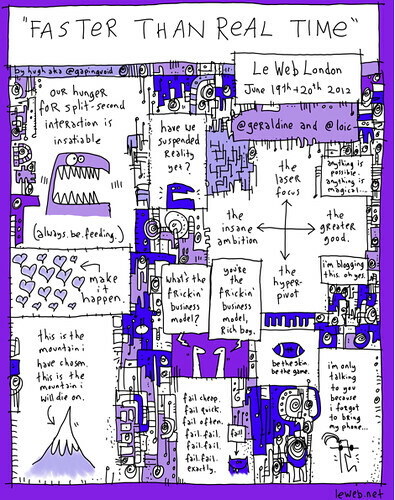 See you at LeWeb, London, June.